If you are going to the trouble to decorate a Halloween tree then clearly you need to go that extra mile and make a Halloween tree skirt. As my dad always says: “a job worth doing is worth doing well”. Same goes for Halloween decorations. This is not my first time making a Halloween tree skirt – shocking I know. I have another Kitschy No-Sew Spider Web Halloween Tree Skirt DIY too. A girl (or guy) needs options right? Plus, what if you have more than one Halloween tree? Well clearly you need to make more than one tree skirt. This monster covered Halloween tree skirt was custom made to match my Black and white Striped Halloween Tree. The hot pink and green panels in the fleece skirt match the ornaments and tree perfectly. I’m kinda wondering if I can make this a real skirt for me to wear, but I digress. The key to this Halloween tree skirt’s cuteness is the Stencil 1 Monster Stencils. Werewolves with underbites, brides with lashes for days and the rest of gang like Dracula and Frank are there too! 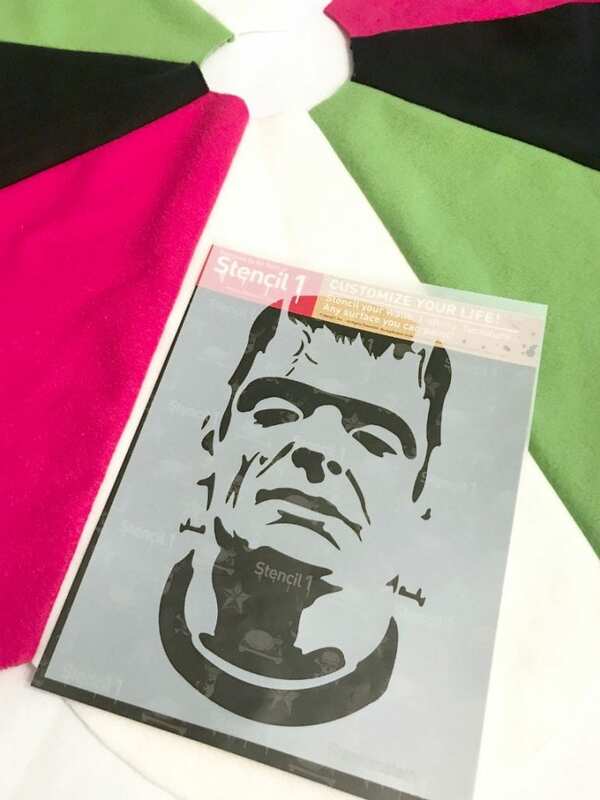 These awesome monster stencils come in large and small. 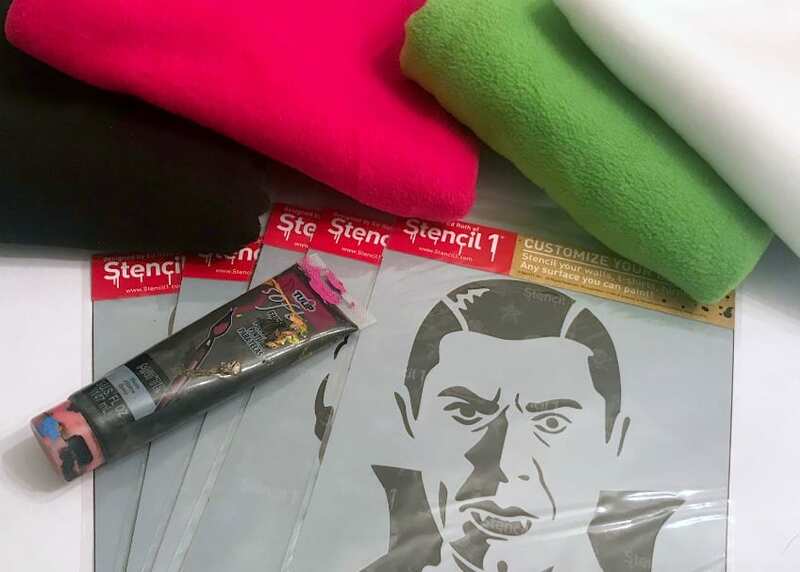 Check out my DIY Stenciled Monster Ornaments for a Halloween Tree. I made these colorful creatures with smaller stencils, felt and of course pompom fringe. OK back to the jumbo stencils and that Halloween tree skirt! I’m not going to go into the nitty gritty of sewing, patterns, cutting and stitching here. 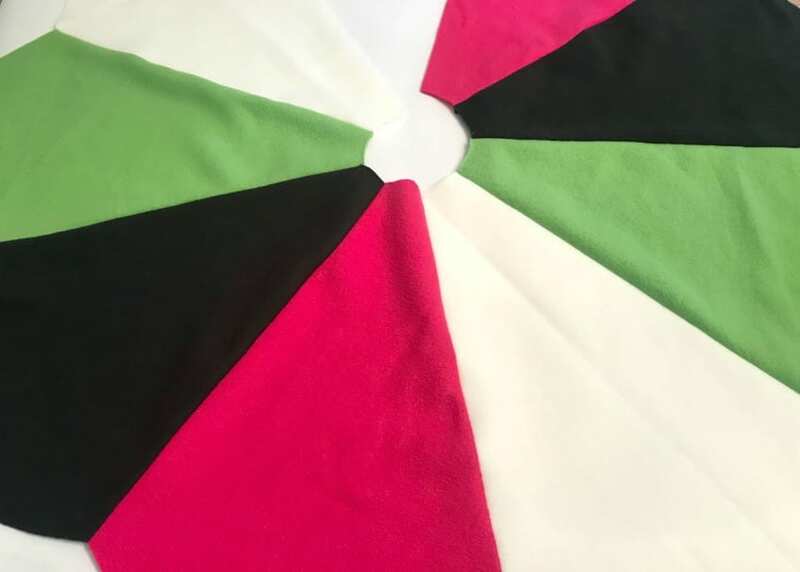 Let me say that my tree skirt is made with panels of hot pink, lime green, black and white fleece. A generic tree skirt pattern was used. An easy trick is to use a ready made Christmas tree skirt (yes they are already out in the stores) as your pattern. 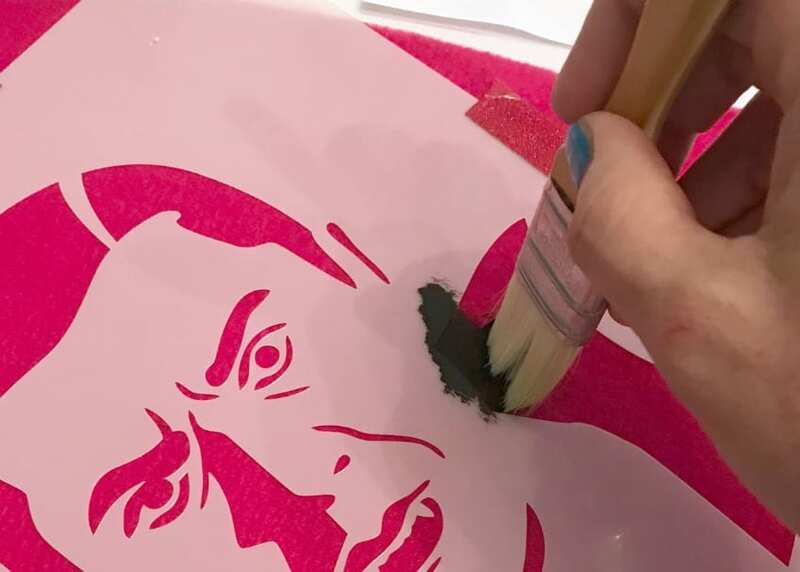 If you can find one in a color you like better yet, stencil right on to that sucker! Want more tree skirt inspiration? 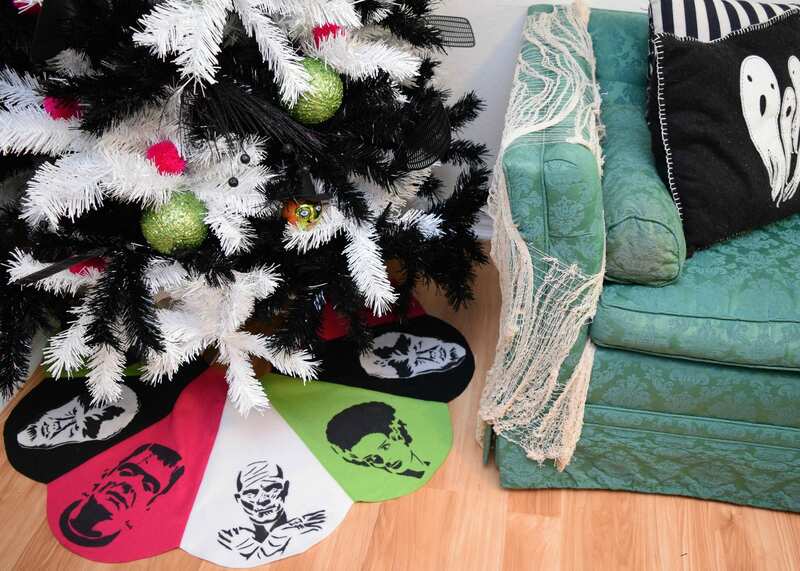 Sure these are for Christmas, but they could still get your Halloween creative juices flowing: Vintage Inspired No Sew Tree Skirt and Kitschy Felt Christmas Tree Skirt. 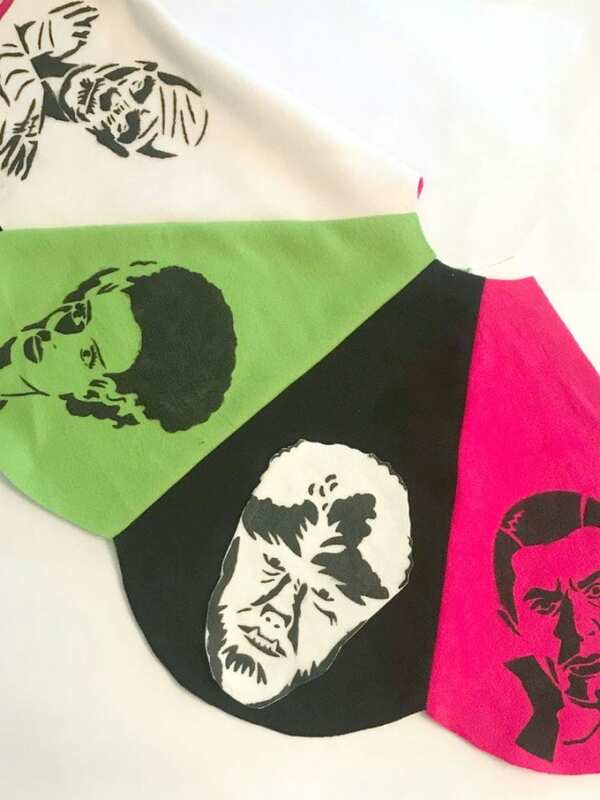 One important thing to remember when making your Halloween tree skirt is to make sure the panels are large enough to accommodate the monster stencils. You will want a different monster in each panel until the pattern repeats. Attach stencil to the fleece with tape so that it stays in place. Using a dry brush technique dab on paint. Dry brush means NOT A LOT OF PAINT. You don’t want the paint to get under your stencil and mess up your design. TIP: Not so into monsters? 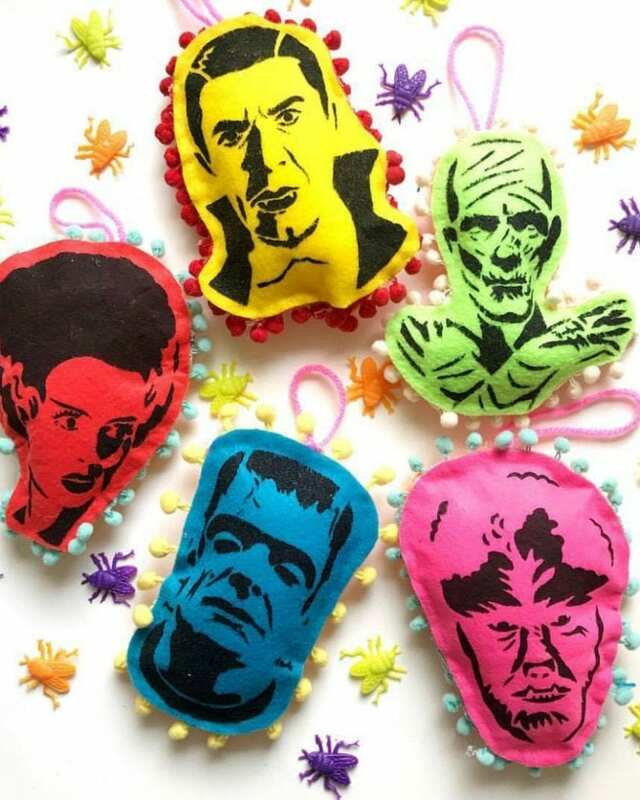 Check out these Spooky Stenciled Halloween Throw Pillows for other ideas. Finish stenciling all the way around the tree skirt. A white piece of felt was stenciled and appliquéd onto the black panels for an extra bit of pop. 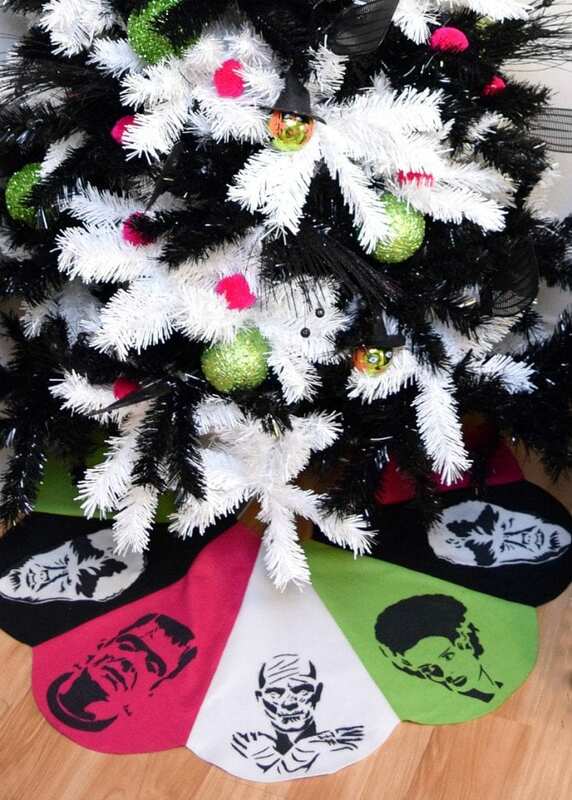 Well hello there adorable vintage monster themed Halloween tree skirt – how you doin’? Tell me you don’t want one of your own! Fleece or felt, monsters or spiders, solid colors or panels – get crazy why don’t you! 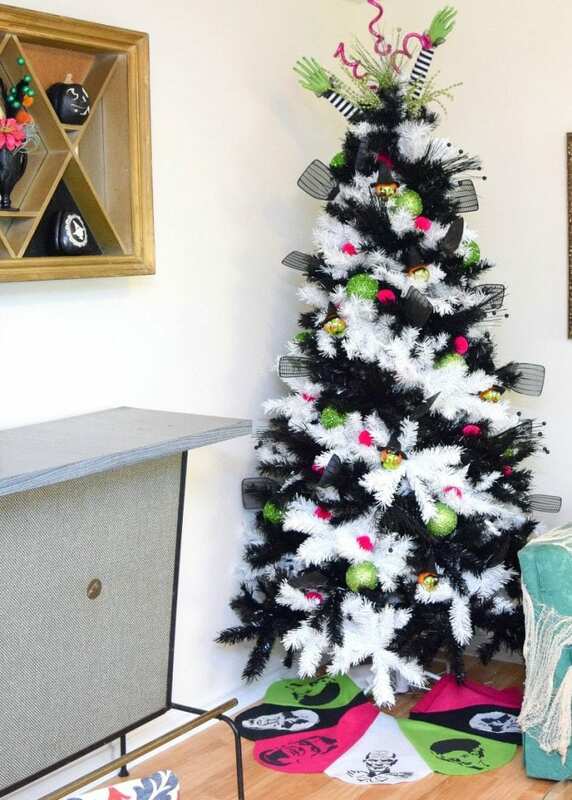 Let your Halloween tree be your creative spirit guide and go from there. Posted October 5, 2018 & filed under Uncategorized. Wow! A Halloween tree! I must be missing something, because this is my first view of this concept! Wow! What a treat for Halloween! Thank you for sharing at Party In Your PJs! This is so creative and such a neat way to use trees year-round! Thank you for sharing at our Merry Monday party. I’ll be including your monster tree skirt in my DIY Halloween Decorations Features next week!